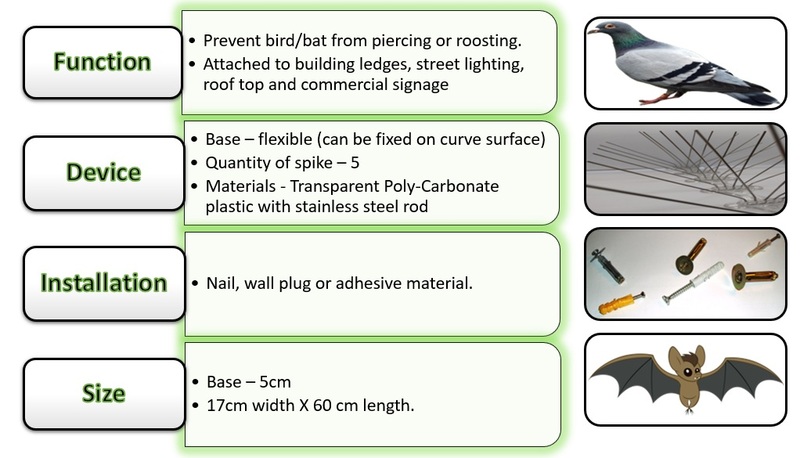 Bird spike X2, also known as an anti -roosting or roost modification, is a device consisting of long, needle like stainless steel rods to attached to building ledges, street lighting, roof top and commercial signage to prevent wild or feral birds from perching or roosting. As we know birds can caused building structure damage, noise problems, as well as aesthetic damage from its nesting and dropping. To keep our living or commercial places away from those uninvited guest, Bird Spike X2 is used for preventing birds invading. Flexible Base : 5 cm base, alternative style and can be fixed on the curve surfaces. Material : Transparent Poly-Carbonate plastice with stainless steel rod. Install : Nail, wall plug or adhesive material. Qty of spike : 5 stainless steel rods. Size : 17cm width X 60 cm length.